I have a confession -I’ve been drinking Eggnog lattes from home for a few weeks now. But being that today is Black Friday, the Christmas Holiday season has officially begun! Now I can share my favorite drink with you without shame. I love eggnog lattes but they can be quite expensive at Starbucks and elsewhere. Instead I prefer to make mine at home for a fraction of the cost. 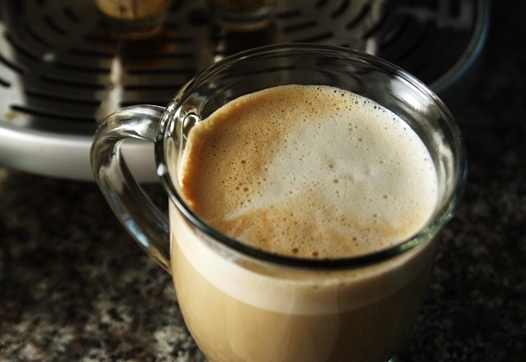 Although technically you need shots of espresso for the drink to be considered a “latte”, you can still make a faux latte by using super concentrated coffee (or instant coffee packs like Starbucks VIA). Enjoy this classic holiday drink at home and keep all those extra dollars you’ll be saving for celebrating Christmas. Enjoy! Variation: If you want to make this as an evening cocktail, add a shot of rum. 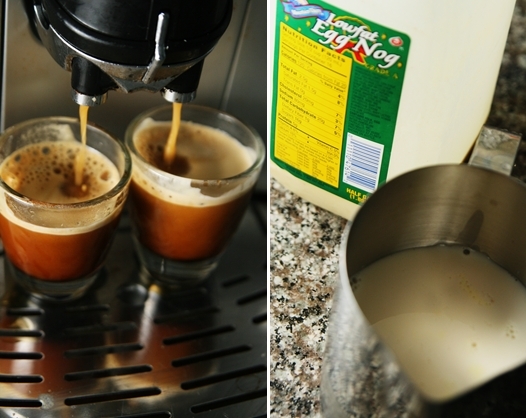 Pour espresso/concentrated coffee into a mug and add steamed eggnog/milk mixture. If you prefer your eggnog latte sweeter, add a little sugar. 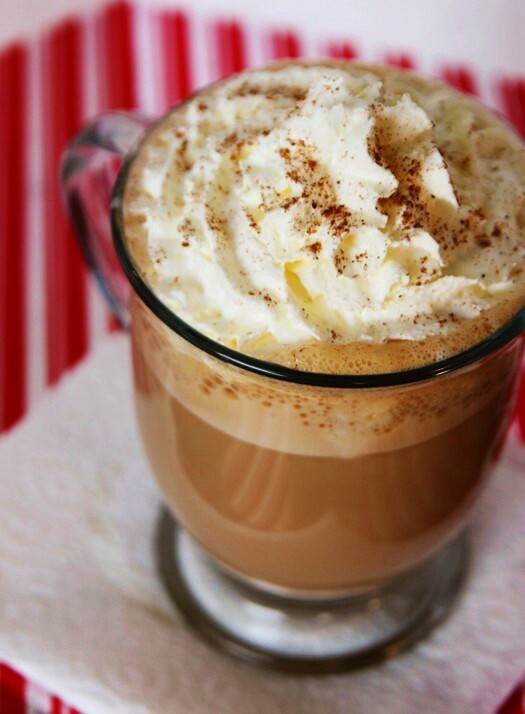 Top off with whipped cream and a pinch of nutmeg. 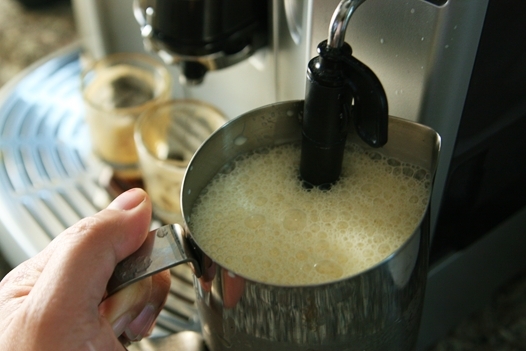 *If you don't have an espresso machine, do what I do most often. Just warm your eggnog/milk mixture in the microwave. Cook times may vary but I prefer heating mine for 2 minutes. Love this recipe, it so pretty! 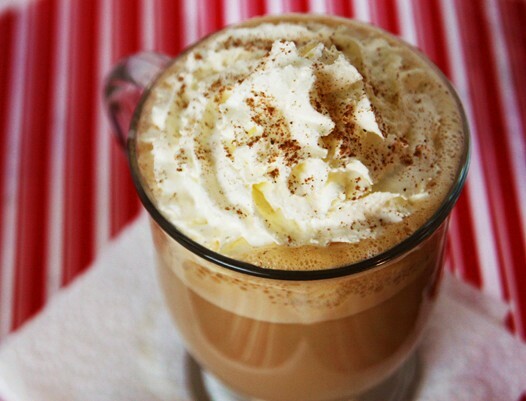 I would also love a good peppermint mocha recipe! Hi Alice, thanks so much for your recipe – you solved a huge dilemma this past Christmas when we were desperately in need of a ENL fix and no where near a Starbucks. Love your blog, I’ll definitely be back! I have some leftover eggnog I just made and I wanted to make an Eggnog latte like the one in Starbucks. Looks good! That sounds delicious, and perfect for the holidays. May I ask what kind of espresso machine you have and what brand of coffee you use? I agree! Making eggnog lattes at home is a great way to enjoy this delicious holiday beverage at a fraction of the price at a coffee shop! In fact I just replenished my eggnog supply this afternoon! Looks great, and funny because I just posted a hot eggnog recipe. I may have to try adding some espresso the next time around. Love the Christmas theme on your site… looks beautiful! I always get excited about “red cup” time at Starbucks, as I call it. I’m more partial to the peppermint mocha than the eggnog latte, but I’m willing to give it a try! I love! I love! I love! Alice, I’ll take 5 … and can you show me how to make Peppermint Mocha Lattes at home, too??? I love this idea. And those little Starbucks coffee packs are actually quite good! Happy Thanksgiving. I can’t wait to try this with and without the rum. Thanks! Toss in a teaspoon of hot buttered rum batter for yet another level of complexity and flavor to this.